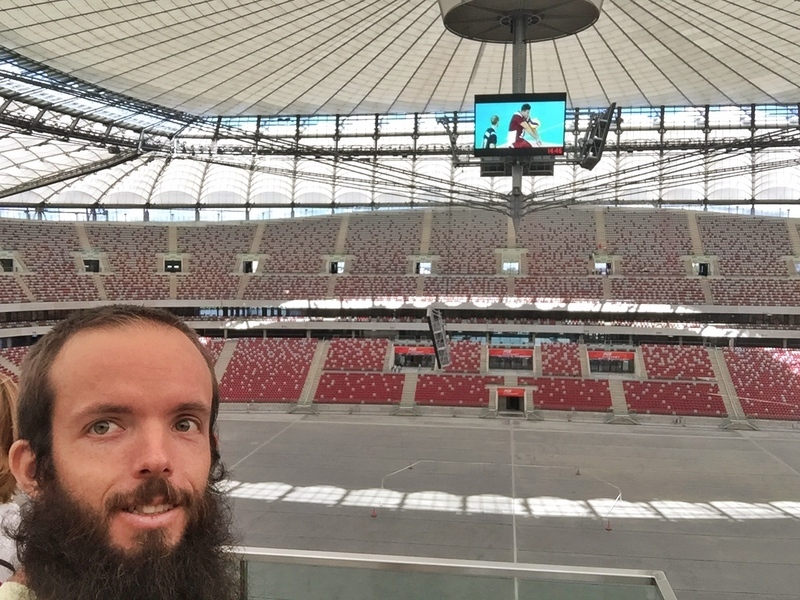 “The National Stadium is not the home ground of any club football team.” – Adam, National Stadium Tour Guide. Adam dropped that fact on us early as we faced the stadiums concrete surface. I’m not sure if I was the only one who was surprised by this or not. 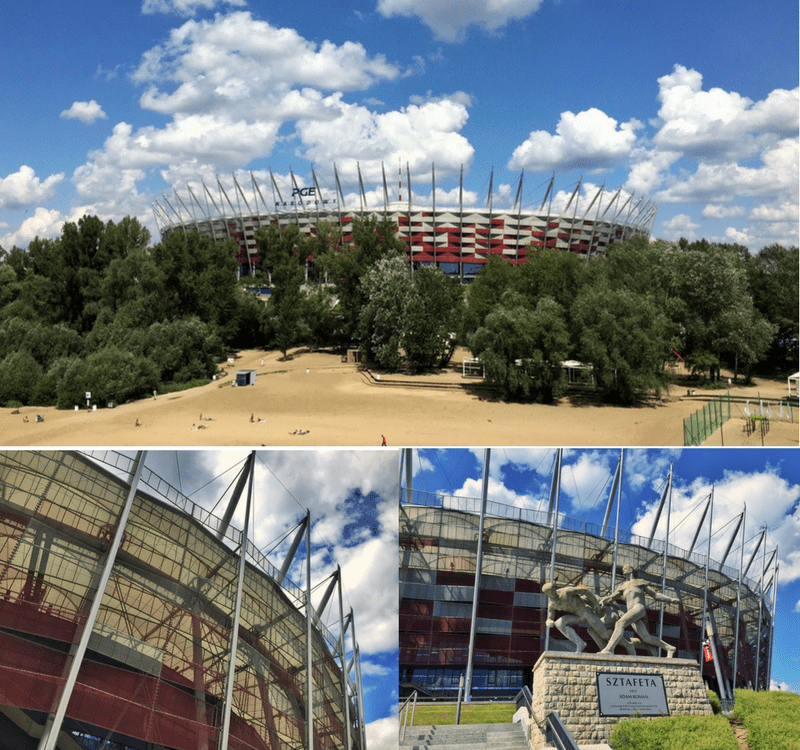 I’d visited Legia Warsaw’s stadium right before and assumed there was another major Warsaw football team who called this stadium home. Apparently not. By the time I arrived at the stadium (a.k.a. 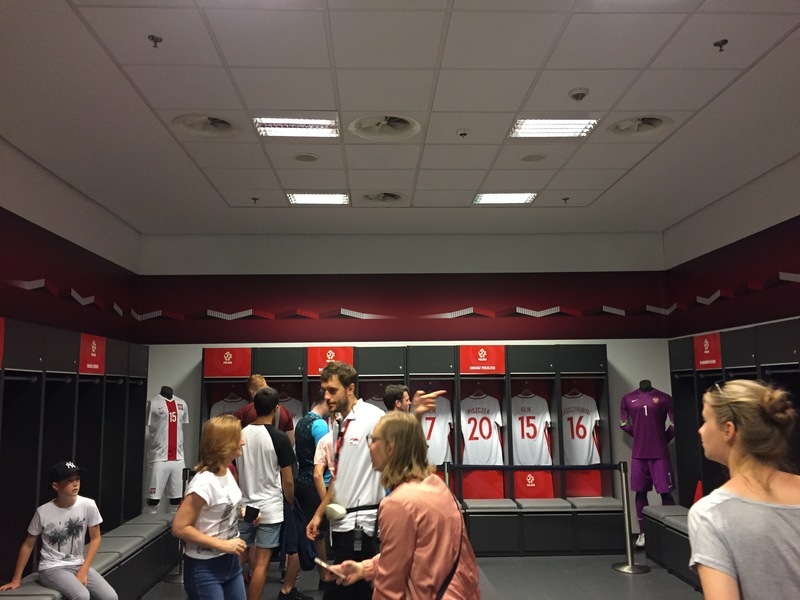 Narodowy Stadium), the 2 pm tour had already started. According to the website, there was only one English tour that day leaving at that time. I was gutted but wanted to try my luck and join if possible. Entering reception they casually said the next English tour departs at 2.30 pm. Either the site is way out of date or they increased the number of tours short term to meet demand. The stadium is open from 7 am – 9 pm. Our group was 15 people I’ve learned this is slightly too many for the best stadium tour experience. 10 is pushing it, 8 is ideal. This allows everyone to get the best photos on the tour without spending precious minutes waiting for everyone to do so. The tour began and I noticed right away how easy the stadium access is. Considering capacity is 58,000, they’ve made it very efficient to get around the stadium. There are 22,000 seats in the bottom section (legions to Europeans) and 36,000 on the top legion. Adam started to give us more information about the stadium and a bit more about the stadium’s purpose. The multi purpose stadium is primarily used for sports events and music concerts. 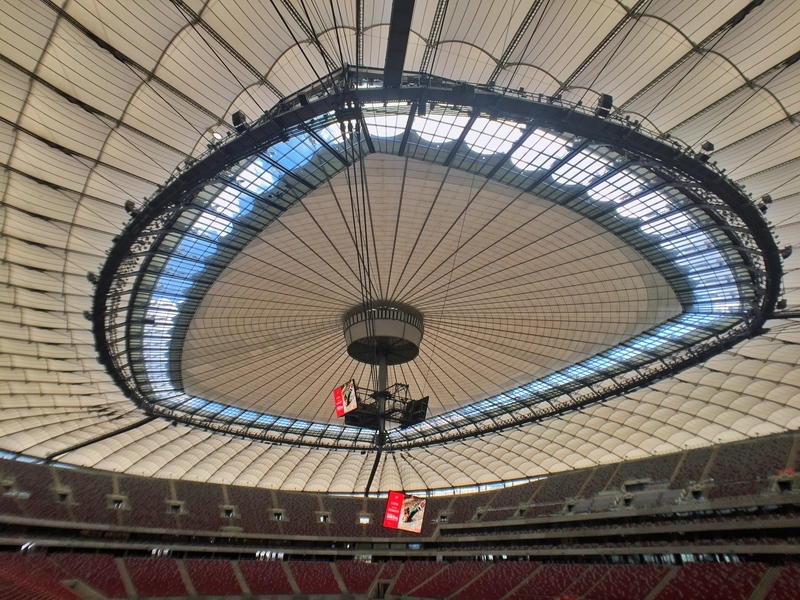 The biggest moment for the stadium was the 2012 Euro Cup. For music, some of the biggest global superstars have played here. Think Beyonce, Metallica and Cold Play. Polands international team play 4-5 games here each year. 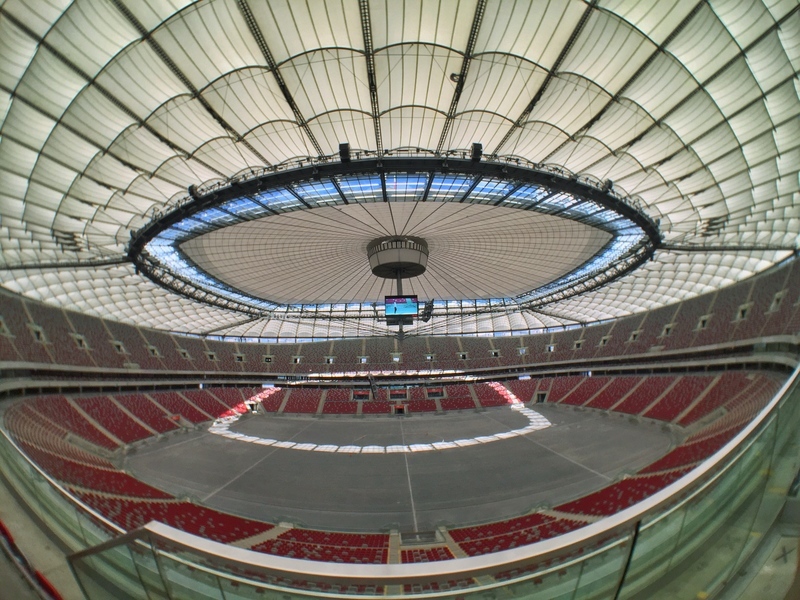 The Polish National team does well on the world stage so tickets always sell out well in advance if you think you might be headed here. They don’t play football on the concrete, obviously. The stadium surface takes six days or so to prepare for a match. 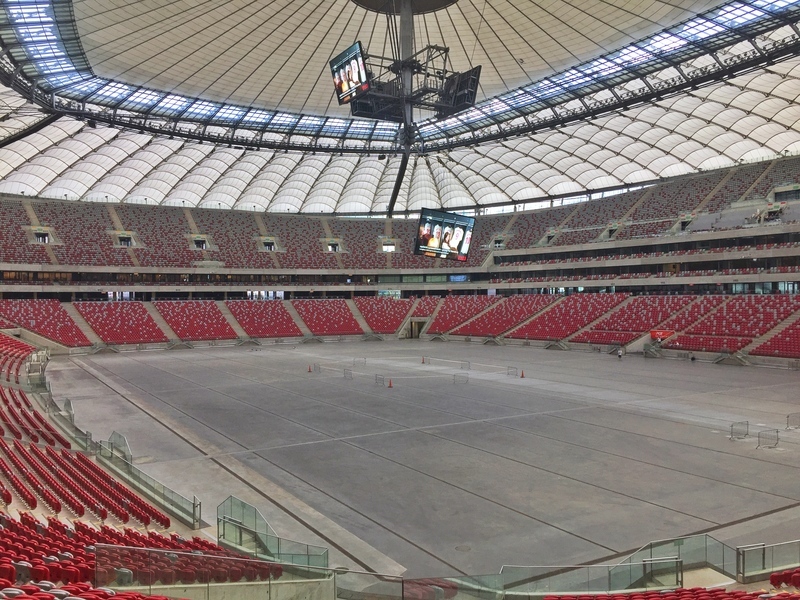 The concrete gets a layover of 10 – 11 cm of soil placed down before the natural grass is laid. The grass is grown specifically for the stadium, yet only gets the one game of use before being thrown out. The dismantling of the playing surface takes two days of work post-game. Standing in the stadium, it’s hard to get a feel for how the pitch looks like with grass. There’s also a lack of advertising banners and stuff as well. It didn’t feel like a traditional football stadium (I know, it’s not). The commentators tribune. Must get noisy on tv? What’s With Churches In Stadiums? When I first saw the church in Camp Nou, I thought that was a bit of a one off. But it’d appear that churches are a common thing in a lot of stadiums (in Europe anyway). The one in here is slightly different. The church is multi faith as a sign of unity and has been blessed by people from Catholicism, Buddhism and Islam. The only markings are black lines to help those ensure people are facing the Kaaba at Mecca during prayers. Great story relating to the church: One of the Poland’s favourite players Robert Lewandowski was due to get married in 2013. As with all celebrity weddings, the paparazzi want to get the magic shot for the cash. Rumours had spread that Robert and his fiance Anna were getting hitched in the National Stadium church. One day around the expected wedding date there was some proceedings inside the stadium’s church.As they were completedthe paparazzi were all waiting outside, they’d figured it out. It’s fair to say an unknown couple was surprised to find people waiting for them outside the stadium as they left via the red carpet. The couple weren’t Robert and/or Anna. Turns out anyone can hire out the space to get married here. Always nice to get one over the paparazzi. The rooms here are actually quite nice with a lot of space. When we entered we were told to not touch the jerseys for some reason. Seemed a little bit odd, as they were simply from the shop shelf. What I liked about them is the material is made from recycled bottles (lightweight). One interesting tidbit: Robert Lewandowski sits on the end of the line of changing rooms each time as that area has a little bit more space. It’s like the VIP section of the changing rooms as the senior players tend to sit on this side of the room too. Otherwise they are fairly standard, with a lot of ice baths. They definitely look after the VIP spectators and guests here. There are two VIP tribunes, totaling 4,500 seats. The main difference for VIP’s that are there purely to watch the game is the comfier seats and of course, the food and drink. 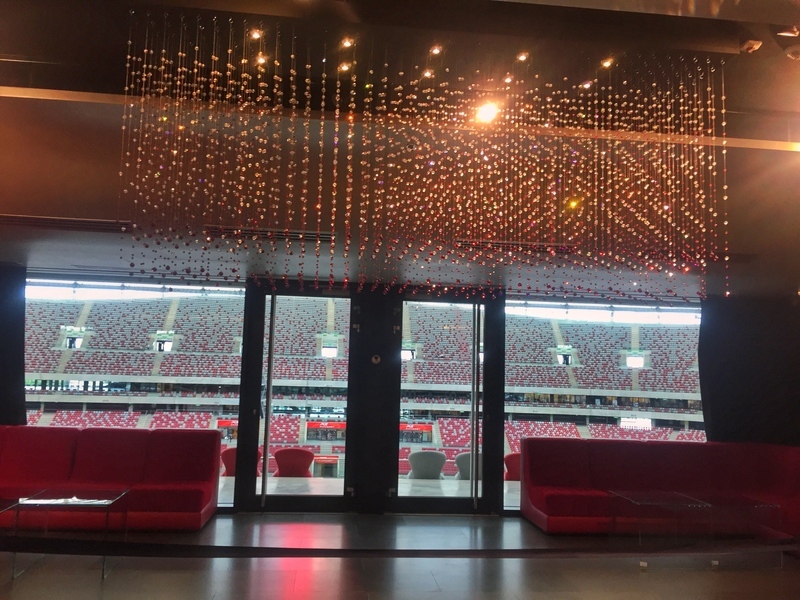 We were also taken into to one of the VIP boxes with Swarovski crystals hanging from the ceiling. Incredibly fancy. 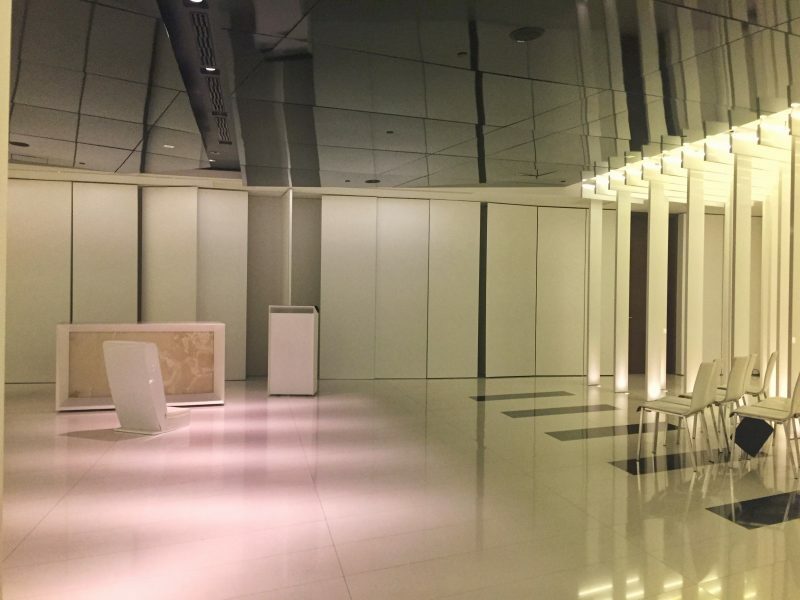 There are apparently 60 VIP rooms, each costing ~2,000 zl per person per game (not 100% sure on that price). Chelsea owner, the Russian billionaire, Roman Abramovich rented one the entire VIP rooms out for the duration of Euro 2012. While plenty of people used the room during the series, apparently Roman himself didn’t go inside once. 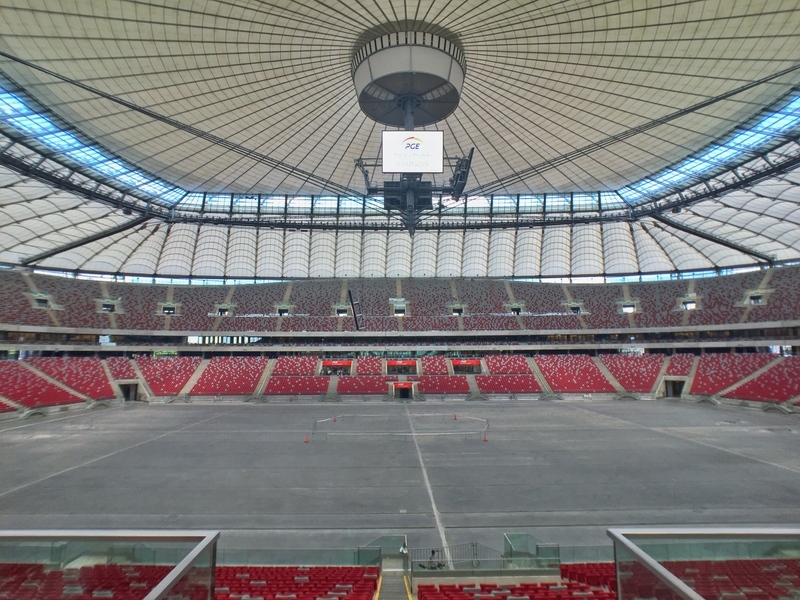 When you buy a National Stadium ticket, you get free access to the viewing platform. I didn’t see this, but it’s always good to know. The reception area is large and you can buy merchandise and get a bite to eat there too. I asked the ladies behind the counter how long the tour takes and she said about 90 minutes or so. Our tour? Was all done and dusted in under 65 minutes. I’m not sure what gives, but there wasn’t any time to take photos. 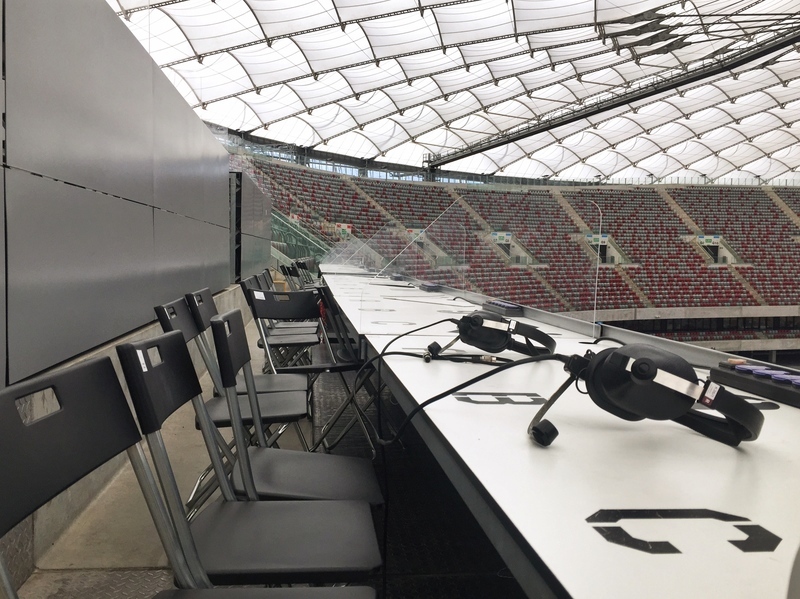 The price was steep relative to other stadium tours in Poland at 27 zl (still, less than seven euro), which given it’s not a specialized football stadium seemed a little odd to me. But the stadium tour was popular with 15 in our group and at least that number of people in the previous group. I haven’t mentioned the press room here. That’s always a great spot to get a photo, but I also feel like stadium tours should include some story telling in here too. 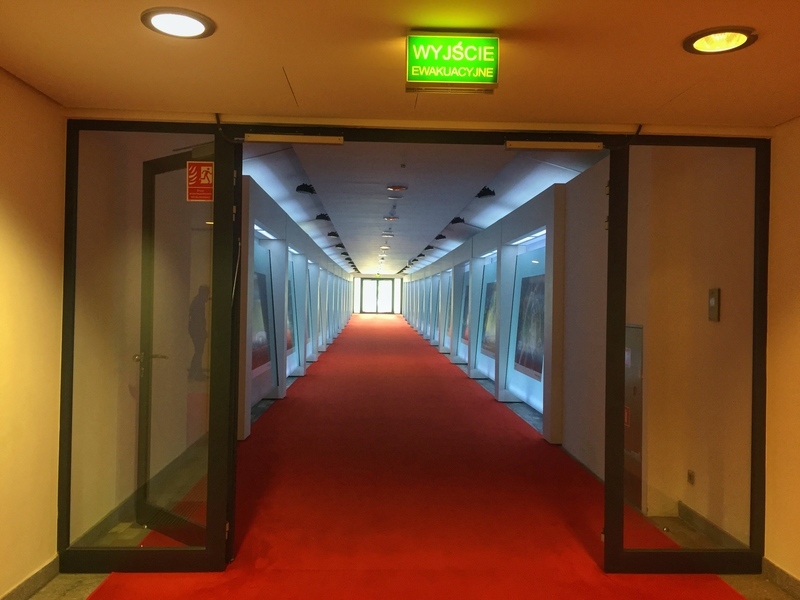 You can walk in about 45 minutes from Warsaw central station. Otherwise your best bet is too contact your accommodation provider. Google location here.